Context: Hair strength depends on integrity of protein structure, aging, and chemical effects and its exposure to mechanical (combing and curling) and thermal (hair drying and straightening) stimuli. Aims: The aim of this study is to correlate the mechanical properties such as tensile yield stress and tensile modulus of single hair fibers with thermal properties such as melting enthalpy and melting point obtained by differential scanning calorimetry. Materials and Methods: Single hair fibers covering seven decades of age were cut 2 cm above the scalp. Tensile specimens were prepared using single fibers with gauge length of 20 mm, and test was carried out with speed of 20 mm/min. For thermal analysis, 2–3 mg of hair samples were cut to 0.5 mm length and loaded in aluminum pan and heated at a rate of 10°C/min from 30°C to 280°C. Data Analysis: Tensile yield stress (determined at the onset of stress constancy at ~3% strain) and tensile modulus were determined using Origin software. The same software was used to plot the thermal data as heat flow (W/g)-temperature diagrams and to determine the peak temperature and peak area (melting enthalpy) by creating a sigmoidal baseline. Results: The typical values of tensile modulus, yield stress, and maximum stress obtained were 5.1 ± 0.5 GPa, 109 ± 9 MPa, and 161 ± 24 MPa, respectively. 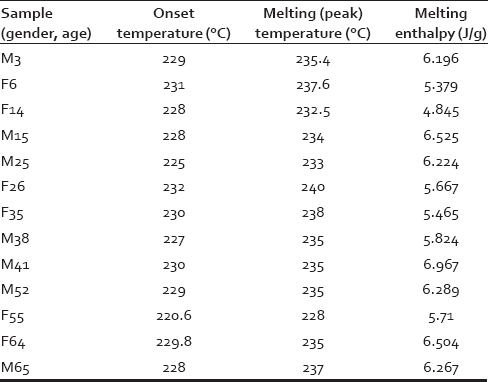 Further, typical values of melting enthalpy and peak temperature determined were 6.29 ± 0.20 J/g and 235°C ± 0.6°C, respectively. Conclusions: Mechanical yield stress and melting enthalpy were compared, and it was found that a good nonlinear (sigmoidal) correlation was obtained. The nonlinear correlation seems to provide an accurate representation of a composite keratin structure wherein the % crystallinity exhibits a range, and also, crystalline and amorphous regions are intertwined and intricate in nature. Hair can be subjected to thermal and mechanical treatments such as permanent waving, hair straightening (hot flat iron), and curling. These treatments have adverse impacts in the quality of the hair, owing to cuticle damage, loss of free, and bound moisture and increase in cross-linking. The quality of the fibers damaged by thermal treatments can be studied by differential scanning calorimetry (DSC).,,,,, Similarly, damages induced by mechanical stimuli were studied by tensile tests.,,, The structure-property correlations were also carried out to check the in-depth quality of the hair due to its composite structure.,, Hair cortical cells consist of crystalline microfibrils (intermediate filaments [IFs]) and cystine-rich amorphous matrix. However, the overall crystallinity (20%–30%) of the hair composite is low compared to semicrystalline polymers (40%–60%). In the review paper by Popescu, it was reported that hair fibers DSC data should be supported by other techniques such as tensile test or X-ray diffraction to check the intensity of damage. However, doing more than one test is cumbersome. Although a few correlations have been reported for the thermomechanical tests performed on various polymers,,, no such correlation has been reported for hair fibers. In this paper, an attempt has been made to find a correlation between thermal and mechanical properties so that one test will suffice to check its quality. Hair samples were collected from people of Hyderabad, India (Caucasian origin) after getting approvals from Ethics Committee. Samples were collected from seven decades of people with males and females in each decade making a total of 13 donors with their ages ranging from 3 to 65 years. Samples were collected from center or vertex of the scalp, washed with a mild shampoo, and then rinsed with water. Samples were dried at room temperature and kept in zip lock covers. Sample preparation used for thermal and mechanical characterizations was described in our previous paper and also discussed below. A total of 39 samples (three samples per donor) were tested to obtain the tensile properties, and 26 samples (two samples per donor) were used in the determination of melting enthalpy and peak temperatures. Hair samples were cut to fine fragments of <0.5 mm length using sharp scissors in an air-conditioned room maintained at 20°C. The fragmented samples were dried at 120°C for 4 h in an oven to remove the moisture (~11.3%) present in hair samples. The conditioned hair samples of around 2–3 mg were packed into a 50 μl aluminum DSC pan and closed by crimping the lid. Shimadzu DSC-60 was used for thermal characterization. The DSC instrument was calibrated with indium sample of 2–3 mg in aluminum pan. Temperature scans were run from 30°C to 280°C at a heating rate of 10°C/min and at 30 ml/min flow rate of nitrogen. More than 26 scans (DSC tests were done twice per donor) were run, and origin software was used for data interpretation, especially in determination of melting enthalpy and onset temperatures. Single hair fibers were fixed to the paper frame, and testing was carried out using ASTM D3379–75. The diameter of hair was measured using microscope at three different positions along the hair length, and average diameter was taken for area measurements. The prepared samples were conditioned for 72 h at 22°C and 55% relative humidity. Mini tensile analyzer from stable microsystems (TA.XTplus, UK) equipped with 500N load cell, and rubber-coated grips were used for tensile testing. Gauge length of 20 mm and test speed of 20 mm/min were used, and samples were tested until fracture in an air-conditioned room maintained at 20°C ± 2°C and 50% ± 5% relative humidity. Above 260°C onset of an exothermic event or an onset of an endothermic event indicating keratin decomposition by-products reaction (e.g., amide crosslinking). All 26 DSC curves were similar in terms of curve shape, but curves differ in the region of constant slope heat flow signal and endothermic peaks corresponding to their temperature representing crystalline phases of keratin. Above 275°C, DSC curves were not shown due to other thermal events mentioned above. In this study, first endothermic peaks corresponding to the melting of the α-keratin crystallites (IFs are 50% helical and have low sulfur content) were considered. Second endothermic peak (matrix having high sulfur content) was ignored because it is less reproducible and also showed the difference in its intensity due to photochemical degradation effects., The thermal properties from DSC plots such as onset temperature, melting temperature (first peak), and area under the curve (melting enthalpy) of all 26 donors were recorded, and average values are shown in [Table 1]. Here, each data point is the average of two values, and intraindividual variation is found to be low but not provided in [Table 1]. This study is not aimed to see any difference exists in thermal and mechanical properties when age and gender are considered. It is aimed to find correlation between thermal and mechanical properties considering seven decades of people covering male and female (due to some technical error, we have omitted one female donor, so correlation was reported for 13 donors). For all hair samples, melting or peak temperatures are in the range of 228°C–240°C and melting enthalpies are in the range of 4.845–6.967 J/g. F55 sample has lowest onset temperature and lowest peak temperature among the 13 donors (considering inter-individual variations) and both temperatures are 5% lower than F26 sample which is found to have highest onset temperature and highest peak temperature. Similarly, the lowest melting enthalpy was observed for F14 (4.84 J/g) donor which is 31% lower than M41 donor (6.97 J/g) which has the highest melting enthalpy. 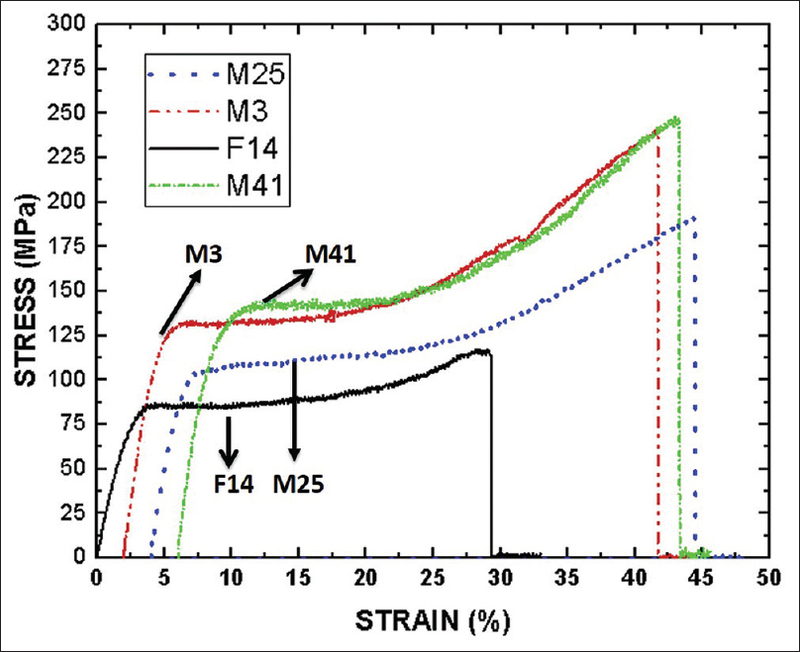 Representative stress–strain plots obtained from tensile testing of single hair fibers are shown in [Figure 2]. From the tests, it is found that hair is very elastic and can be stretched up to 50% of the initial length. In few samples, hair curling was observed immediately after the fracture at one end of the sample. The stress–strain plots can be split into four characteristic regions. The fourth region also known as postyield region 2 in which yielding and an ultimate failure occurs (between and 33%–45% strain). The tensile properties of all 13 donors (elastic modulus, yield stress, yield strain, maximum stress, and maximum strain) are shown in [Table 2]. Here, each data point is average of three values, and intraindividual variation is provided as standard deviation. All the properties were measured using origin software after converting load-displacement plots to stress–strain plots. Here, yield stress is determined as the onset of stress constancy and the end of linearity (Hookean region), whereas modulus is determined by fitting the linear line between 1% and 2% strain. It can be seen that yield stresses are in the range of 82–126 MPa, and maximum stresses are in the range of 161–231 MPa. 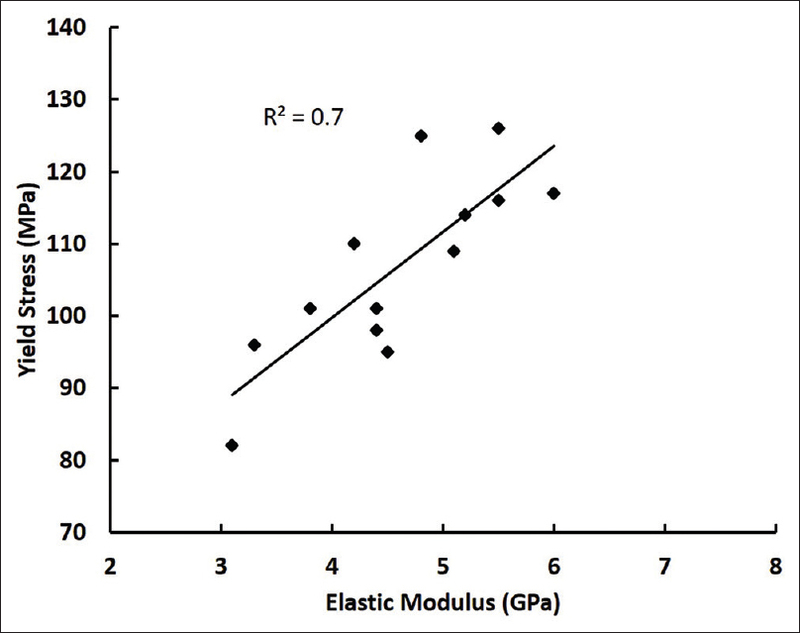 From [Figure 2] and [Table 2], the elastic modulus was found to be in the range of 3.1–6.0 GPa. Hair fibers having lower elastic modulus (<4 GPa) revealed higher elongation values (>40%). Yield strain of the hair fibers is found to be between 2.6% and 4.4% (~10% of the maximum strain), and this could be the reason why hair is not considered as choice of material in technical textiles. The hair from M15, M25, and M41 donors has higher yield stress and maximum stress whereas hair from M41, M52, F55, and F64 donors was found to have higher elastic modulus. Hair from F14 donor was found to have the lowest modulus (48% lower than F64 donor), lowest yield stress (35% lower than M41 donor), lowest maximum stress (38% lower than M15 donor), and the highest elongation (34% higher than M41 donor), indicating the weak structure of the hair composite [Table 2]. 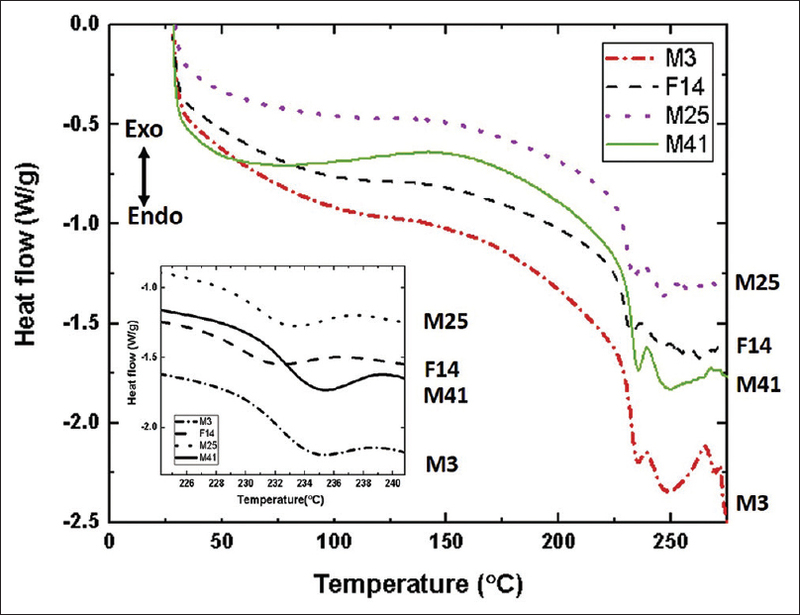 Comparison of properties among 13 donors resulted in higher yield stress and higher melting enthalpy for M41 and lower yield stress and lower melting enthalpy for F14 indicating some correlation between thermal and mechanical properties. 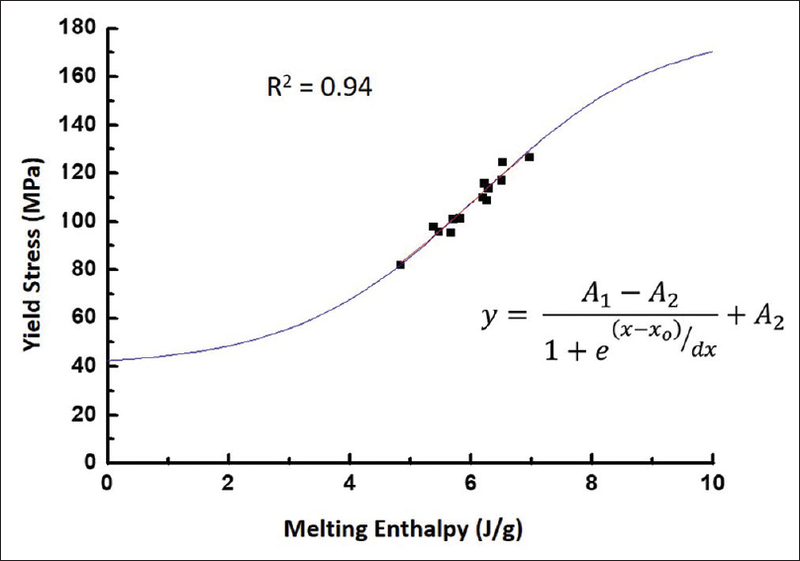 In this study, we have considered only the first endothermic peak for determination of enthalpy of melting of alpha-keratin [Figure 3]. The endothermic peaks that were obtained varied from deep and narrow to shallow and broad. The observed broader peaks and low melting enthalpy values [Figure 3]a could be attributed to structural defects in hair composite at interfaces or boundaries, orientational inhomogeneities, and heterogeneous crystal size distribution. Further, as commonly reported for semicrystalline polymers,, the enthalpy of melting corresponds to the percentage of crystallinity of the alpha-keratin phase and that a strong correlation between the enthalpy of melting and yield stress exists. In summary, the enthalpy of melting obtained from the endothermic peak provides a relative quantification of the percentage of crystalline phase in hair samples. Since the fiber properties such as elastic modulus and yield stress (onset of the constancy of stress and the end of linearity) are considered to be within the elastic limits, a correlation between these properties was studied and shown in [Figure 4]. It can be seen that a positive trend with a moderate R2 value of 0.7 was determined between yield stress (force/area at yield point) and elastic modulus (slope of the stress–strain curve before the yield point). It should be noted that yield stress value primarily corresponds to the percentage of crystallinity and elastic modulus corresponds to the packing, overall rigidity and stability, and quality of α-keratin crystals which are embedded in the cross-linked amorphous keratin matrix. A highly crystalline material will exhibit a strong correlation with a higher regression value as observed for highly crystalline polymers.,, In contrast, the composite nature of the hair fibers with a low percentage of crystallinity is expected to show a weaker correlation wherein the yield stress is dominated by the percentage of crystalline fractions, and the elastic modulus is determined by the overall packing of the composite structure comprising both crystalline and amorphous fractions. As shown in [Figure 5], y and x are yield stress and melting enthalpy. A1 and A2 are lowest yield stress (40 MPa) and highest yield stress values (180 MPa). Simulated x0 is the melting enthalpy at y = 110 MPa ([A1 + A2]/2) wherein maximum slope is observed (in our simulation the x0 value is 6.1 J/g). ([A2 − A1]/4dx) describes the slope at the point x0 and indicates the steepness of the curve. Here, dx is a shape or slope constant (in our simulation the dx value is 1.5524). If dx is small, the steepness of the curve will be very high and vice versa. Hence, dx can be considered as a thermomechanical heterogeneity factor to describe the heterogeneity of the structural properties obtained from hair samples. The sigmoid correlation between the properties describes evolution from a set of properties for 0% crystallinity (completely amorphous plateau) to 100% crystallinity (completely crystalline plateau). This is in contrast to the simplified linear rule of mixtures correlation wherein the crystalline and amorphous fractions are noninteracting. Hence, we conclude that a nonlinear sigmoid correlation seems to provide an accurate representation of a composite keratin structure wherein the % crystallinity exhibits a range, and crystalline and amorphous regions are intertwined and intricate in nature. Furthermore, the correlation also indicates that the mechanical and thermal properties in discussion correspond to a common structural aspect. In this case, the range of mechanical and thermal properties corresponds to % crystallinity range of the 13 donors. Finally, the usefulness of the correlation can be envisioned in conducting DSC scans on hair samples to provide both thermal and mechanical property evaluation quantitatively. As a note of caution for the future investigations, the correlation plots that can be used for diagnosing/characterizing hair samples based on different ethnicities, age range, gender, and lifestyle must contain a large sampling regarding quantity and a substantial range of properties, i.e., thermomechanical heterogeneity for them to be accurate and valid. The novelty is the investigation of the correlation between thermal and mechanical properties for hair fibers. The reason for such a study is the following. In other materials, a correlation study similar to this is conducted for two reasons, one is to reconcile the mechanical or any other response with a thermodynamic (thermal) explanation and its correlation with structure and the other is to try and establish whether by conducting DSC scans (thermal tests), prediction of mechanical or any other properties can be made, both qualitatively and quantitatively. In this paper, a correlation between yield stress and melting enthalpy has been reported. For hair samples, such correlation is reported first time, and this is achieved by taking samples covering seven decades and genders. This study was funded by the Department of Science and Technology, Government of India. Duration: 2014-17; Project No: SB/FTP/ETA-064/2013. Mckittrick J, Chen PY, Bodde SG, Yang W, Novitskaya EE, Meyers MA. The structure, functions and mechanical properties of keratin. JOM 2012;64:449-68. Cao J. Melting study of the α-form crystallites in human hair keratin by DSC. Thermochim Acta 1999;335:5-9. Cao J, Leroy F. Depression of the melting temperature by moisture for alpha-form crystallites in human hair keratin. Biopolymers 2005;77:38-43. Wortmann FJ, Wortmann G, Marsh J, Meinert K. Thermal denaturation and structural changes of α-helical proteins in keratins. J Struct Biol 2012;177:553-60. Milczarek P, Zielinski M, Garcia ML. The mechanism and stability of thermal transitions in hair keratin. Colloid Polym Sci Colloid Polym Sci 1992;270:1106-15. Mohan NH, Ammayappan L, Sarma DK, Debnath S, Tamuli MK. Characterization of thermal properties of pig hair fibre. J Nat Fibres 2017;14:459-65. Mishra S, Kunchi C, Venkateshan KC, Gundakaram RC, Adusumalli RB. Nanoindentation and tensile testing of human hair fibres. J Mater Sci 2016;51:10191-204. McMullen RL, Zhang G, Gillece T. Quantifying hair shape and hair damage induced during reshaping of hair. J Cosmet Sci 2015;66:379-409. Popescu C, Gummer C. DSC of human hair: A tool for claim support or incorrect data analysis? Int J Cosmet Sci 2016;38:433-9. Menyhard A, Suba P, Laszlo ZS, Fekete HM, Mester AO, Horvath ZS, et al. Direct correlation between modulus and the crystalline structure in isotactic polypropylene. Express Polymer Lett 2015;9:308-20. Batista NL, Olivier P, Bernhart G, Rezende MC, Botelho EC. Correlation between degree of crystallinity, morphology and mechanical properties of PPS/carbon fibre laminates. Mater Res 2016;19:195-201. Anisioa da Paz R, Damiao Leite AM, Araujo EM, da Nobrega Medeiros V, Alves de Melo TJ, Pessan LA. Mechanical and thermomechanical properties of polyamide 6/Brazilian organoclay nanocomposites. Polimeros 2016;26:52-60. Spei M, Holzem R. Thermoanalytical investigations of extended and annealed keratins. Colloid Polym Sci 1987;265:965-70. Resendiz-Munoz J, Corona-Rivera MA, Fernandez-Munoz JL, Zapata-Torres M, Marquez-Herrera A, Ovando-Medina VM. Mathematical model of Boltzmann's sigmoidal equation applicable to the set-up of the RF-magnetron co-sputtering in thin films deposition of BaX Sr1-x TiO3. Bull Mater Sci 2017;40:1043-7.